Pulp | North Canton, Ohio | dreaming of the next bite. It’s exciting to talk about another great place to eat healthy in Canton. The newest location of Pulp Juice and Smoothie Bar has opened at the strip. This is actually the third smoothie spot in Canton within a two-mile radius, (the other two being Robek’s and Smoothie King). Let’s face it, smoothies are the rage right now, even McDonalds is jumping on board. I’ve typically preferred Robek’s over Smoothie King, (although ultimately I would take Jamba Juice if I had the choice). Robek’s is good, but the hangup is often this: if you want a smoothie, but are also hungry, you’re limited to power bars, cookies, and other grab-and-go packaged snacks. But if you need “real food”, i.e. a meal, you have to go elsewhere. 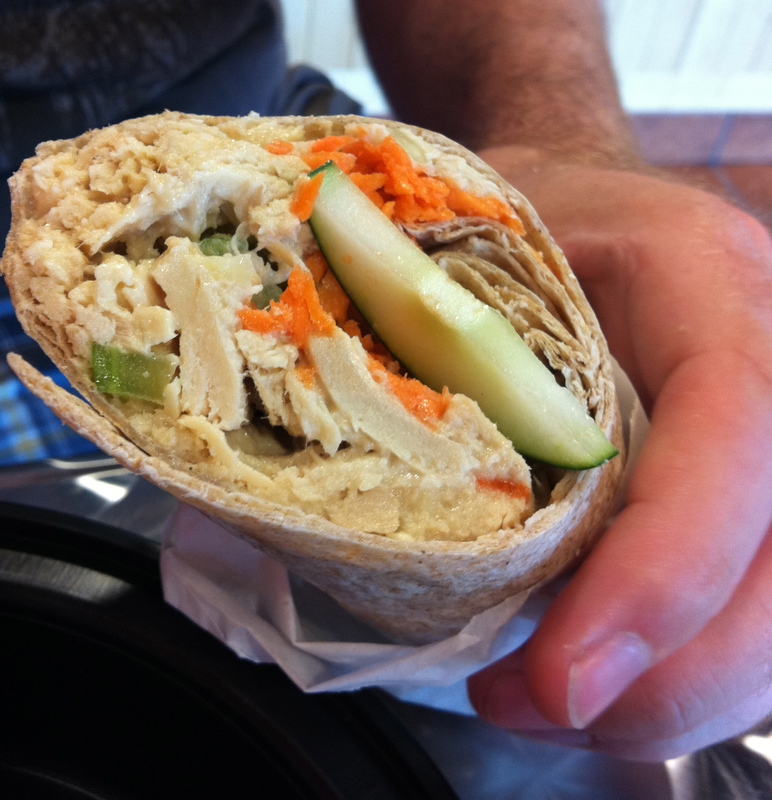 Well Pulp has recognized this problem and created a small but effective menu of freshly prepared wraps, salads, and soups to accompany their smoothie offerings. Genius! Pulp’s smoothies are typical of what you would find at Jamba or Robek’s. I’m not sure there is more or less selection, or that they are more or less healthy. They offer the same free “boosts” of secret magic powder, that allegedly give you things like immunity, energy, and or even hangover relief. One Pulp original is a trio of “high-energy smoothies” that incorporate sugarfree or regular Red Bull, along with fruit and sherbet. (Sounds delish, haven’t tried one yet.) As for juices, they offer fresh-squeezed Apple, Carrot, Celery, and others. I tried the apple-carrot; my guess is it was not sweetened at all, but if so, it’s minimal. But onto their menu items, because this is where they really set themselves apart. I have now tried a total of three wraps: first the PB&G. Sadly I didn’t get pics of this; you just have to trust me on this one. A whole wheat tortilla wrap is filled with a mixture of peanut butter, sliced bananas, honey, granola, and vanilla yogurt. It’s like having dessert but without the guilt. So yummy. 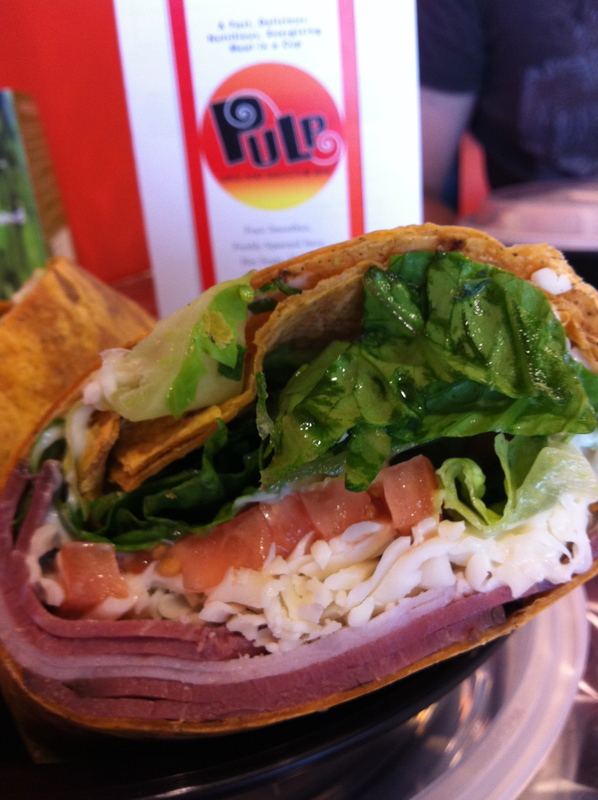 What you see above is the “Pulp Club” which has turkey breast, roast beef, provolone, mozzarella, tomato, romaine lettuce, and light mayo on a tomato basil wrap. Again, can’t go wrong here with delicious, fresh, and healthy ingredients. Last but definitely not least we have the tuna wrap: white albacore tuna, mayo, shredded carrots, celery, cucumber, and romaine. Delicious as is, but the piece de resistance – which oddly they do not even include in the description on the menu – is a wonderful dressing to accompany the tuna, which seems to be an asian sesame (and maybe ginger too) sweet dressing. Whatever it may be, smothered on the tuna this wrap is amazing. It’s really a play on Japanese seared ahi with a sweet asian sauce. Yum. O. So definitely check out Pulp at the strip, or one of their six other locations (Kent, Macedonia, Mayfield, Mentor, and Streetsboro). This entry was posted in Canton, OH and tagged healthy, smoothie by Yvette (@foodiedreamer). Bookmark the permalink. I can assure you that the juices are pure juice…no sugar added! Great to know, Kathy. And thanks! If only there were nutritional facts available for thier menu!